sailboat. : An old photograph! cutenessssss :) i love flipping through old pictures! Haha what a lovely picture! It makes me smile :) Happy Saturday to you too! This is a beautiful photo, your hair was so pretty! I've got so many photos like this lol usually me asleep in boxes or hangi half out of bed or off the sofa! Ahh :) this is nice, we have similar photographs lurking around somewhere. Aww, so cute :) I shudder to think what's lurking in our family albums!! You can't beat the 90s, ever!! That is just so sweet!!! I love this. One of my favourite things to do is go through our photo basket. Old photographs are so special. 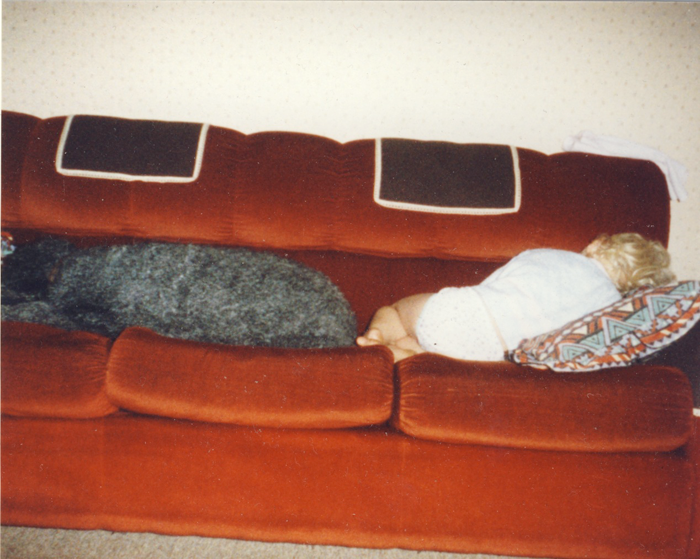 Haha we used to have a sofa exactly like this except it was a lovely murky green colour!! Gotta love the 90s! Adorable. I love looking at old snaps!